The 54th GRAMMY® Award Winners in some categories were released before the televised presentation held at the Staples Center in Los Angeles on February 12, 2012. If you want to see results of your favorite artist or genre, all categories for GRAMMY® Award winners and nominees will be shown when they are released. 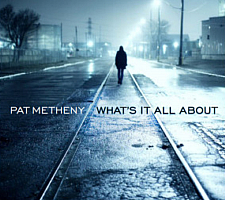 Pat Metheny won a GRAMMY® Award in the New Age Music category for his What’s It All About album. Selected best out of five albums total in the new age music category, Pat Metheny’s 19th GRAMMY® award was selected by voting members of the National Academy of Recording Arts and Sciences (NARAS). The GRAMMY® Awards, inaugurated in 1959, was formed to recognize artists for their achievements in the music recording industry. Andreas Vollenweider’s Down To The Moon has the honor of being the first new age artist to win a GRAMMY® in the New Age category in 1986. The National Academy of Recording Arts and Sciences had earlier classified the award as Best New Age Recording. The World Music Genre category was first initiated in 1991, when Grateful Dead member Mickey Hart won an award for his Planet Drum album. While the New Age Music Genre and some others only have an award category for Best New Age Album, maybe someday more categories like Best New Artist and Best New Age Song will be added, and included in the televised broadcast. Visit PatMetheny.com to sample or purchase. Sample every nominee’s album on the article I wrote titled 54th GRAMMY® Nominees; Best New Age Album. If you want to read more about NARAS history, you can visit the Wikipedia page for GRAMMY® Award for Best New Age Album. Photos are courtesy patmetheny.com & grammy.com.